OptiMind Reviews - Is it a Scam or Legit? According to AlternaScript LLC (the company behind OptiMind), they analyzed “over 50 years of neuroscience research” when picking and choosing the ingredients in their nootropic. In fact, OptiMind’s founders originally developed the formula for their own use, verifying its efficacy before ever releasing it to the public. Suffice it to say that many of OptiMind’s ingredients have fairly substantive evidence showing them to be effective for a variety of mental conditions, especially tyrosine, phosophatidylserine, bacopin, vinpocetine, and huperzine a. But the effects may not be as noticeable as the company makes them seem (we’ll come back around to this shortly). Or, at the very least, their benefits might be limited to very specific circumstances. For example, tyrosine is listed as possibly effective for improving mental performance and memory, although research is mixed and it seems to work best under stressful conditions (such as military training). Tyrosine may also be helpful for improving alertness following a lack of sleep. Here’s another example: SerinAid is a proprietary form of phosphatidylserine manufactured by Chemi Nutra. Although the manufacturer doesn’t provide any publically available clinical support for their claims, as a standalone ingredient, phosphatidylserine is listed as possibly effective for addressing some aspects of age-related mental decline and Alzheimer’s disease. However, this only references phosphatidylserine derived from cow brains, and not the soy or cabbage-derived version often found in supplements. On top of this, all but two of OptiMind’s ingredients are part of a proprietary blend, which means we can’t know exactly how much the supplement contains, or if it’s enough to be effective (again, more in a second). We know you’re itching to learn more about our conversation with OptiMind’s CEO, but we’ve got one more thing to talk about first: price. Alternately, you can choose the 14-day trial, which means you’ll receive 10 capsules of OptiMind for free. Then, after the trial ends, you’ll be enrolled in the company’s autoship program, which means you’ll keep receiving a new bottle each month and charged accordingly. Compared to a lot of the other nootropic supplements we’ve reviewed, it seems like OptiMind’s autoship program is hassle-free; if you want to opt out, simply log in to your Account Center, or give customer service a call at 888-784-9315, and you can cancel immediately. Fortunately, we had the opportunity to speak with OptiMind’s CEO Lucas Siegel over the course of about an hour. Lucas seemed extremely passionate about the work he does, and we think it’s important that you learn about the company through his own words. How Did OptiMind Come to Be? Several years ago, Lucas and co-founder Matthew Piskorz were traders who worked crazy hours in an extremely competitive environment. As a result, they wanted an edge—a healthy way to boost their cognitive performance, but without using risky drugs. To do this, they envisioned what they wanted: a supplement that could provide clean energy and boost memory. From there, they hired the best FTC attorneys to dig through decades of research and find only those ingredients with substantiated claims. Then, they had a baseline for a formulation, which they could bring to chemists and others within the scientific community. After they had a formulation that provided results (more about this next), the new company, named AlternaScript, was founded in 2013. Initially, their product was called Alleradd, but once sales skyrocketed after being featured in VICE and other media outlets, they rebranded to avoid naming conflicts with existing pharmaceuticals. In short, no. But they do have a whole lot of positive feedback from customers, here on HighYa and elsewhere online. However, OptiMind operates in what Lucas called a “structured claims space.” Within this space, you have completely ridiculous and unsubstantiated claims on the left side of the spectrum, and pharmaceuticals (such as Adderall), which are only available through doctors and are FDA approved to treat diseases, on the right side. According to Lucas, OptiMind falls nicely in the middle; its ingredients aren’t necessarily “proven,” but they have a substantial amount of double-blind, placebo controlled clinical evidence nonetheless. How Does OptiMind Stack Up Against the Competition? Invariably, a healthy proportion of brain supplements we review come with ultra-low customer feedback, so we wondered how Lucas felt about operating within an industry with a less-than-stellar reputation. Lucas mentioned that OptiMind isn’t even in the same ballpark. The supplement is formulated and manufactured in two GMP certified laboratories (one outside Los Angeles and another outside Portland, OR), which batch test each ingredient to make sure it’s pure, stable, and contains no toxins. On top of this, Lucas claimed that the ingredients themselves are much better than a lot of the competition. For example: The bacopa monneiri contained in OptiMind contains 55% bacosides (this references the concentration of the active compound). Comparatively, most other companies use 20% bacosides, which is cheap, abundant, and easier to process. But according to Lucas, 20% bacosides isn’t mentioned in the research, so why would other companies include it in their formulations? From a business perspective, Lucas also outlined for us how AlternaScript and OptiMind are light years ahead of the competition. Why? Because they want your business and they’re in it for the long run. You won’t have to worry about difficulties cancelling your autoship enrollment, since you just need to call, email, or text their in-house customer service, who’s based in Austin, TX. In fact, Lucas claims he spent over $130K developing an online platform (the Account Center we referenced above) where customers can cancel their trials and autoship programs with a couple clicks of the mouse. And if a glitch occurs, a notification gets sent to the tech team, who will then manually cancel. Ultimately, Lucas claims you have to display a certain level of integrity if you run a subscription business, which is why they put so much effort into distinguishing themselves from the rest of the industry. If OptiMind Contains Better Ingredients, Why Does It Cost Less? Lucas explained that with most other brain supplements, most of their money goes into their marketing costs, not their raw materials. These companies don’t have internal media teams, so 100% of their marketing is accomplished through affiliates and much of their profit goes toward paying them. So, with this business model, Lucas claimed that it’s impossible to turn a profit unless you charge way more. Despite their higher prices though, Lucas claimed that compared to OptiMind—who hires some of the best chemists in the world---these other supplements often hire lower-quality labs who cost much less, and often aren’t GMP certified. What’s Up With OptiMind’s Proprietary Formula? Remember how we talked about the fact that, because OptiMind’s ingredients were part of a proprietary formula, we couldn’t know how much of each it contains? We asked Lucas why the company didn’t reveal this information. Ultimately, he told us that it all comes down to business. In other words, the exact formulation has to be kept private, or there’s no intellectual property whatsoever. So, how can you know if it works? First, Lucas recommended comparing OptiMind’s reviews with a lot of the other brain boosting supplements out there. This way, you can see that it’s worked for a lot of customers, and that a level of trust has been built between them and the company. Second, he recommended ordering a 10-capsule trial and trying it out for yourself. As long as you set a reminder to cancel your trial/autoship enrollment, it’ll only cost you a couple dollars. As an added bonus, before our conversation with Lucas, he was nice enough to send us a care package, which included one bottle of OptiMind, along with sample and full-size bottles of the company’s Rest Up supplement. Overall, we thought the packaging was very nice and professional, and we liked that it included booklets outlining what OptiMind is, how it works, its ingredients, how to use it, as well as 7 tips outlining how to be effective throughout the day. Based on everything we’ve learned here, do we think ordering OptiMind is a smart decision? 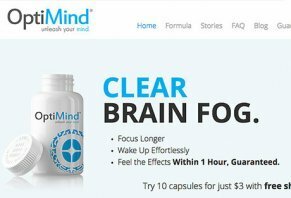 Will OptiMind Optimize Your Brainpower? Based on Lucas’ willingness to speak with a consumer advocacy website like HighYa, along with his openness about OptiMind—in our opinion—speaks volumes about the company’s trustworthiness. Sure, not all of the supplement’s ingredients have reams of clinical data to support their claims, but the vast majority of the company’s customers seem pleased with their experience, which is a big departure from what we normally see with these kinds of products. Should you order OptiMind? Ultimately, this is something only you can answer. As always, just be sure to speak with your doctor before you do. But—and it’s not often that we’re able to say this here at HighYa—OptiMind seems like a completely legit product from a company who’s passionate about top-notch customer service. Just keep in mind that if you take the recommended two capsules per day, OptiMind will cost you a little less than $70 per month. What’s your experience with OptiMind? Did it work? If so, do you feel the results were worth the price? Whatever happened, be sure to tell us about it by leaving a review below! I hope that anyone buying the product will take the bad reviews seriously and save themselves, because they will take your money and you will not get it back. I know that scams like OptiMind often use paid five-star reviews to build up a reputation they don't deserve, but this is just like any other run-of-the-mill business scheme that relies on customer negligence and forgetfulness for profits. I signed up for the free trial and, like everyone else it seems, was charged around $80 five days later. I was into day seven of the free trial, and mind you had already stopped taking the pills - if you look at the ingredients, this pill is a glorified multivitamin. So I called and was on hold for about half an hour to try to cancel the subscription and get back the money they took, was eventually forced to leave a message because I had to get ready for work, and I never heard back. So I emailed them as well - they offer emailing as an option outside of calling that can actually lead to getting your issues solved, but I received an automated response, so that is not the case. Suffice it to say that after much rigamarole they wouldn't give me a refund, but they did go ahead and offer me a discounted rate for a double bottle order at $63.65. So I had a good laugh at that one. Don't order this pill. It does nothing, they will find reasons to keep charging your account, and they are a brick wall when it comes to negotiation. Wash a B2 supplement down with some coffee every day and let this company go bankrupt like it should. Never, ever order from their site. I was charged $75 for a product that doesn't work and when I tried to get a refund, they were unhelpful and strange. Do yourself a favor and not buy this product. It will save you the headache. I ordered this supplement in high hopes of it working, and after two months of it not working, I called to cancel the subscription. They mailed it anyway. I called them to mail it back, and their representative told me to put RTS (return to sender) and they would refund my credit card. They did not refund my card because they said I put RTS on the package and they could not process the return. They got their product back unopened, and I have tracking on the package that they did receive it, and they still charged my card for a product that was returned. I will give bad reviews for their product, and they are not very honest. I even have their transcript that THEIR REP told me to put RTS on the package. I never do this, but I feel like I have to. To give you some background, I am a wife, a mother of 3 beautiful daughters, I have a full-time job, and I just started school again. I decided to try this thing called OptiMind. They have a trial, but I had to pay $10 for shipping. During the trial, my husband and I did not like the person it made me. I not only didn’t get any of the promised affects (and yes I did the suggested actions to help out), I planned out each day; how much time I would spend on school work and made out a planner and everything, but the pills made me irritable, and I seemed angry. After I stopped taking them, I feel much better. Well, like any busy mom would, I forget about things. Last night they charged $73 to my account. So I figured if I contacted them and let them know what happened maybe be we could work it out. That’s not how it happened. I emailed them first thing this morning, told them my symptoms and explained I forgot, hoping they would understand. But the response I got was not at all what I expected. They told me I agreed to the terms when I made the purchase, and they are not going to send my refund. But what really got me was they didn’t even mention my symptoms, not an explanation or apology or anything. If you decide to try them out, please take into consideration what I went through. Also, while you are checking out for your trial date, they prompt you at least five other times to buy more of their products and you have to either agreed to buy the products or keep clicking "no thank you." I’ve been a supplement buyer for many years and have seen and tried many different potions. I buy for a small Cooperative in my area. My brother turned me on to OptiMind, and I was skeptical but hopeful. The first day, I had increased energy, deep ability to focus, and my mind was positive. The second day, same, and I was excited to try again. Days later, I contacted the company and asked them to rush my order! That’s not something I do. So I’m pleased and will talk about it to my clients and continue to take it myself. I got the trial of this, and it did nothing. Then I find out the company charged me, without asking, $80 of the pills! They made a loophole of being pale to charge you by putting the receipt in the terms and conditions of their pill! They are scam artists and everyone could save money with a cup of coffee or tea. I am trying to get my money back right now so I’ll keep everyone posted. I don't know if this person is an ESL or not, but one sentence they wrote made no sense at all. It was: "They made a loophole of being pale to charge you by putting the receipt in the terms and conditions of their pill!" Maybe someone can explain this to me. I was never reimbursed and was charged $73.32 again the next month. I called again. I was told they had no record of the cancellation, and that it was my word against theirs. Then the agent said they had been having quite a few problems with one agent who said they were canceling and then wouldn't, and if I knew the name of who I canceled with, they'd reimburse. Of course I don't remember a name after a month back. I asked for a manager, and he wasn't available. He was supposed to call back and never did. I had asked the agent's name I was speaking with and the supervisor who would call me back. He gave me the names Luke and Kennedy. When I called this time, I asked for Luke or Kennedy and the agent, Tess, said no one worked there by those names, and that the computer showed I'd spoken with Kyle and Tim, so obviously they gave me fictitious names. Their guarantee is worthless. I've basically lost $146. Buyer beware! I've been trying to cancel since August; I've sent emails, I've called. For the longest time, the "forgot password" email was not sending, and I couldn't log into the website even. Once I could actually log into the website, the cancel feature doesn't even work and every contact option brings you back to the same dead end. I'm shaking angrily. They have charged me $207 for this pill when I wanted the free trial and tried to say I hated it once I had the sample in hand. It made me feel absolutely awful. And if I would have had a subscription choice I would have only asked for one bottle, not two every single month! I have them piled up because I don't want them! I got extremely sick, I want my money back, and this entire brand is a scam. You can't even leave a review on their website! So how are those even real? Auto trial, plus fake paid 5-star reviews. Do not buy or use free trial. 1) Shady autoship practices snuck in with the "free trial." 2) Poor customer support and no refunds, regardless of satisfaction or even allergic reactions. 3) Poor communication when trying to cancel autoship subscriptions (website says one must "call" to cancel and gives no online ability to remove payment information!). 4) Poor proprietary blend; low amount of mg's for important info and overloaded caffeine amount!! Do NOT buy or support these practices! It's unfortunate, but I have to say that OptiMind is zero quality all across the board. I don't normally do reviews, but I have to sacrifice sometimes to do this in order to save some peoples money. First of all, I only signed up for a 14-day trial. Of course, shortly after I got a full bottle delivered and charged to my account and two more full bottles a month later. I don't normally order things online since it is a scam a lot of times, but I was very excited about this product. When my 14-day trial came I was excited and I took it every day as it was advised on the package. I didn't feel anything and I read a few reviews and research and decided to give it a little bit more time, and when the first bottle arrived I decided to try it for the full month and see how it is going to "change my life." Very unfortunately, nothing happened except that I get way too much caffeine in my body which caused me to be all over the place and not focused at all. Two cups of coffee can do the same job! I have to note that I live a very healthy lifestyle with lots of exercise and meditation so I'm very sensitive to anything artificial as I don't consume artificial things. I feel that I can use some help on my focus but 10 minutes of meditation can do a better job and that is completely free and does not cost 80 bucks. So I called to cancel and to get my money back from the unused bottles, but of course, customer service failed me as well as the product. An agent named Nikki flat out told me that the money back guarantee was only for the first 30 days and they will not give my money back or help me out with the four packages that I cannot consume. Well as long as the sale is done their work is done. I don't trust the product, I don't trust the company, and I don't like the customer service. And I don't like the fact that I have to take time out of my precious life to do this. I wish I could send this money to people who need it, but the rich are getting richer and you are not getting smarter. I signed up for the free trial, and just a week later I was charged $69.31. I've called three times and all three times it persists you to leave a voicemail. Finally, I left a voicemail. The website says that you may call or TEXT at any time to cancel. I immediately received a text with smiley faces after every response. They assured me that I needed to call. So they will TEXT you, but not answer or respond. I've always sent an email without a response. This company is a scam, do not buy! Write a Review for OptiMind!